Grade 1 Spelling words include words with both long and short vowel sounds, as well as nouns, verbs, color and number words, and many sight words. 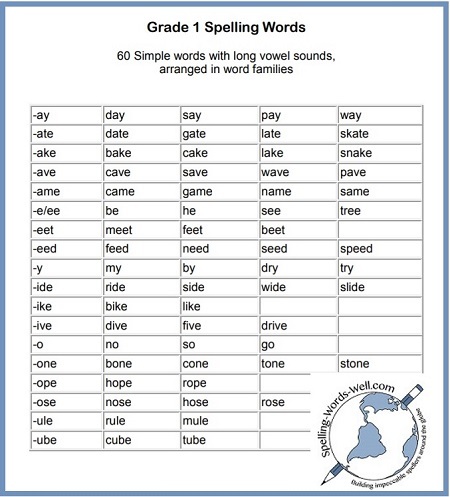 This chart contains 60 relatively simple words with long vowel sounds for first grade spelling. Print this list of Grade 1 Spelling Words. Not all first graders will master all of these words. But when spelling words are presented in the word families as shown, most students are able to learn a lot of words quickly. Be on the lookout for more long vowel word families to add to this list. Keep a word wall with the latest additions. Then use all these words in classroom activities. For example, ask students to copy sentences like these, completing each one with a different long-vowel word. Did you notice how I worked in a lot of long-vowel words in just these three sentences? 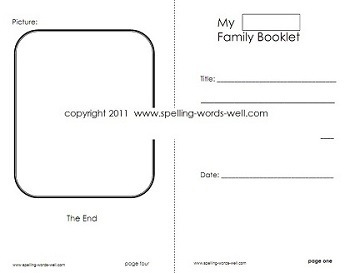 Word family 1st grade worksheets - Worksheet and booklet templates so your 1st graders can practice spelling any word family anytime! Complete instruction included when you follow the link. 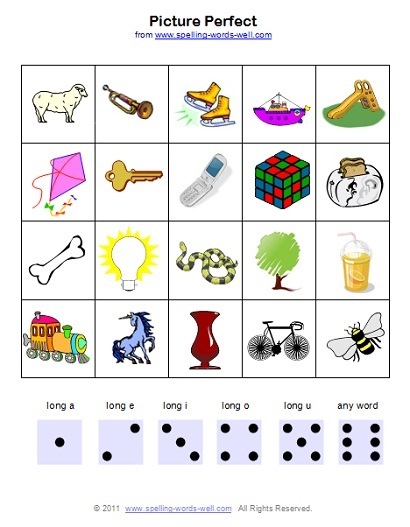 See our entire collection of first grade worksheets for lots of good spelling practice. First grade phonics worksheets - 5 free first grade worksheets provide practice Students get lots of printing practice with easy words. Picture Perfect Game - Engaging pictures on this game board, featuring long vowel words. Fun for everyone! 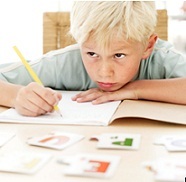 See our entire assortment of Phonics Games & Activities. Hands Up and Hop to It!- These simple, fun games will get your kids' attention, and keep it.